I hope you’re surviving the cold winter temperatures—the best way is to curl up with a hot beverage, a comfy couch, and a good book! Trifles and Folly is now on audio, and Trifles and Folly2 just came out on 1/29! Now you can get all of the Deadly Curiosities stories and books for your listening pleasure! In case you missed it, Sons of Darkness (the first in the new Night Vigil urban fantasy series) and Spells Salt and Steel: Season One (the collection of the first four Mark Wojcik monster hunter novellas) came out at the end of 2018! Season One is available in ebook, print and hard cover, and the audiobook edition is in the works! Cauldron: A Joe Mack/Shadow Council novella (Falstaff Books) kicks off a brand new series set in the Roaring Twenties, featuring supernatural vigilante Joe Mack—the immortal champion also known to steelworkers as Joe Magarac. Convicts & Exiles—a prequel to the Ascendant Kingdoms, telling the story of Blaine and his friends before their return to Donderath. We’re also working on a couple more brand new series, so stay tuned! Freebies—SciFi and Fantasy giveaways on Prolific Works including our stories! 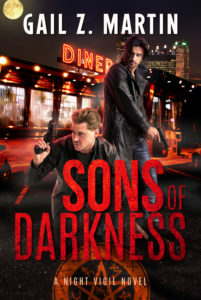 Sons of Darkness, my new urban fantasy, is now available in ebook and print! Demon-hunting former priest Travis Dominick works with the misfit psychics of the Night Vigil to fight supernatural creatures and malicious paranormal activity. When a series of disappearances, suicides and vengeful spirits cause havoc and death along a remote interstate highway, Travis teams up with former special ops soldier and monster-hunter Brent Lawson to end the problem with extreme prejudice. Check out all the cool blog posts and interviews, plus giveaway on the book tour! Assassin’s Honor is now available in audio, as well as ebook and print! Imagine Butch and Sundance as medieval assassins…. Joel Breckenridge and Garrett Kennard are King’s Shadows, elite assassins serving the crown of Landria. When a shadowy itinerant holy man starts captivates the nobility with treasonous whispers, Ridge and Rett go rogue to stop the threat, save the kingdom and protect the king–while landing on the ‘Most Wanted’ list themselves? Look for a new virtual book tour with reviews, giveaways and exclusive content starting Nov. 26! Also new in audio—Salvage Rat, Tangled Web, Vengeance, Trifles and Folly, Trifles and Folly 2 and Storm and Fury! Free books and stories to chase away the winter chill! Starting November 22, you can get an excerpt from Salvage Rat and more than 21 other stories about Future Warriors in the Lethal Weapons giveaway! What’s new with Morgan Brice! Check out the Winter Wonderland online scavenger hunt for a chance to win a copy of Lucky Town and other books, plus a Kindle HD Fire, Amazon gift cards, and other cool prizes! Happy Fall—Lots of New Stuff! Things haven’t slowed down yet around here—we’re just in pumpkin spice overdrive. 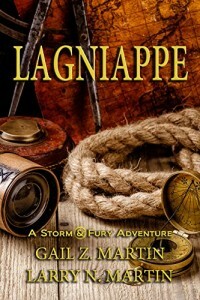 Salvage Rat, by Larry N. Martin, is now live! Think, Bonnie and Clyde meet V for Vendetta in a Firefly-esque universe. Close Encounters, the newest Mark Wojcik monster hunter (New Templars) novella is out from Falstaff Books! 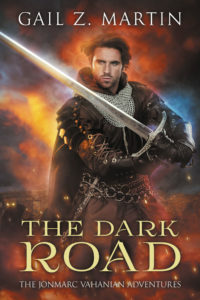 The Dark Road, the second Jonmarc Vahanian Adventure collection, is also live! Coming Soon: Watch for Sons of Darkness, the first book in my new Night Vigil dark urban fantasy series, to show up in October! Also, Assassin’s Honor, first in the new Assassins of Landria series, will be released in print, ebook and audiobook on October 23! I’ll be at the West Virginia Book Festival October 26-28, so come on by if you’re in the area, catch up on reading material for the winter, and say hello! Watch for these upcoming blog tours with all-new Q&A, guest blog posts and giveaways! Watch for new #HoldOnToTheLight posts from David and Sharon Weber, Faith Hunter, Kat Richardson, Lucienne Diver, Christine Amsden, Samantha Dunaway Bryant, and Chris Shrewsbury, plus articles about the campaign from Space And Time Magazine and the Winchester Family Business blog! Watch for forthcoming posts from Jody Lynn Nye, Cat Rambo, Faith Hunter, Jeanne Adams, Darin Kennedy, Jean Marie Ward, Kat Richardson, Jay Requard, Melissa Gilbert, Tally Johnson, Candice Carpenter, Jaym Gates, James MacArthur, Rich Gaultieri, Lynn Zubernis, Laurena Aker, and more! What’s New With Morgan Brice? Morgan Brice is my pen name for writing urban fantasy MM paranormal romance. I’ll have my Morgan Brice books with me at WV Book Festival, but I’m also a Featured Author at RomCon in Richmond, VA Oct 5-8 and at GRL in Portsmouth, VA Oct 16-21. Burn (Witchbane 1.5) is out! It picks up right after the events in Witchbane and serves as a bridge to Dark Rivers (Witchbane 2) which will be out in October! One hundred years ago, a sheriff’s posse killed dark warlock Rhyfel Gremory, but his witch-disciples escaped, and their magic made them nearly immortal. Seth uncovers a cycle of ritual murders that feed the witch-disciples’ power, and he saves Evan Malone, one of the warlock’s potential victims. 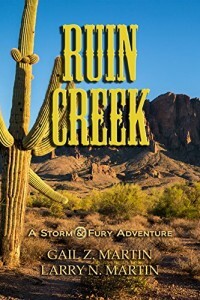 Neither Seth nor Evan expected to fall in love, but when the dust settles, they find themselves on the run and on the road together, tracking the next killer. Fate and danger threw them together. But once the adrenaline fades, will love last? Stay Tuned for another October Treat featuring an all-new Badlands Halloween story, coming soon! Vengeance is out! It’s the sequel to Scourge (which won the Manly Wade Wellman award for NC spec fic), and Corran, Rigan and their outlaw friends have fled beyond the walls of Ravenwood City, hunting monsters and trying to stay out of the clutches of the guards! They thought they stopped new monsters from coming through, only to discover that there’s a much bigger conspiracy and they’re in way over their heads! 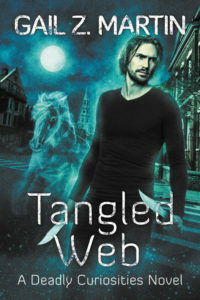 Tangled Web is the third Deadly Curiosities novel, and it’s action-packed! When a malicious weaver-witch awakens the spirit of an ancient Norse seoir warlock and calls to the Wild Hunt, Cassidy, Teag, and Sorren—and all their supernatural allies—will need magic, cunning, and the help of a Viking demi-goddess to survive the battle and keep Charleston—and the whole East Coast—from becoming the prey of the Master of the Hunt. 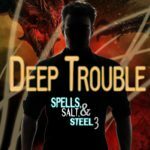 Deep Trouble is the third Mark Wojcik Monster Hunter novella (in the Spells, Salt and Steel universe). Mark Wojcik fights a dragon, has a battle of wits with the ghost of Mad Anthony Wayne, and even takes on the infamous Pig People of Radio Tower Hill, but when the angry spirits from a bloody mine disaster come looking for vengeance, Mark knows he’s in deep trouble. New from my alter-ego, Morgan Brice! 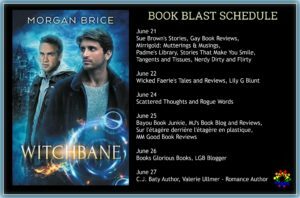 As Morgan Brice, I write Urban Fantasy MM Paranormal Romance. Here’s what’s new! Check out the Cupcakes and Books Scavenger Hunt—Ready to win Amazon cards, romance books and other prizes? I’m one of the sponsors of the Night Owl Romance CUPCAKES & BOOKS Scavenger Hunt. During this event I’m going to help you find some great new books. Make sure to check my featured title out along the way. Enter now by clicking on the picture! Contest runs August 16-September 6! It’s October, and that means cool weather, early dark, fun-size candy, ghosts, ghoulies and long-legged beasties—and my Days of the Dead Blog tour! I write about ghosts, necromancers and haunted places, so it only makes sense for me to do a blog tour in the week when you get All Hallows Eve, Samhain, Dia de los Muertos AND Halloween together! So this year, we’ve got all kinds of goodies….coming attractions on new series, a few teasers about the upcoming Warhammer original novel, a sneak peek at Vengeance (sequel to Scourge), and news about the new Deadly Curiosities novel and new Iron & Blood novel planned for 2018! And of course, the links to fun excerpts of my stuff and some of my friends’ books because what’s Halloween without Trick-or-Treat goodies! Watch for blog posts this year on these wonderful sites: I Smell Sheep, Risingshadow, BeautyInRuins, SciFi Chick, The Qwillery, Magical Words, Cecilia Dominic Blog, Barnes & Noble Mind Meld. Here’s a Rafflecopter giveaway of Spells, Salt and Steel! Have you read the newest stuff! Grab Bump in the Night fast—it’s a limited-edition book bundle that’ll be gone faster than your Halloween candy! Nine full-length spooky novels for $2.99! And it’s a great way to get my Trifles and Folly collection of 10 Deadly Curiosities short stories for a great price! Haven Harbor Halloween—Four novellas, only .99 for a limited time. They all have connections to Jeanne Adams Haven Harbor universe, which features mysteries in a town settled by the descendants of witches who fled Salem to avoid the Trials back in the day. My story is Keepsakes, a Deadly Curiosities novella where a string of bizarre murders—all linked to stolen cursed items—have Cassidy, Teag and Sorren trying to stay one jump ahead of a killer. 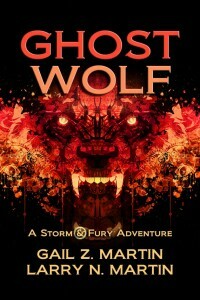 The Hunt: A Storm and Fury Novella. Department of Supernatural Investigation agents Mitch Storm and Jacob Drangosavich are back for more Steampunk adventures. People have vanished and part of the Adirondack Forest is missing. Are aliens or airships to blame? Unraveled: A Deadly Curiosities Novella. Charleston’s restless spirits turn dangerous as a ghostly serial killer returns for a new murder spree. Cassidy, Teag and Sorren must outwit an undead entity that kills for thrills and find what tethers his spirit to the city to stop the bloodshed before Teag becomes the next victim. Remember—all of my books except Iron & Blood are on audio! (Spells, Salt and Steel is in process.) You can even use your Audible free trial! Love my books? Join The Shadow Alliance, my free street team on Facebook. The Shadows get extra contests, goodies and get-together, plus they’re where I turn for beta readers and ARC readers! Do you follow me on Twitter @GailZMartin? 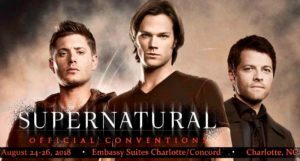 I tweet a lot from conventions, about Supernatural, and about books and cool stuff. Be sure to follow me on pinterest.com/Gzmartin for boards on Abandoned Places, Supernatural, food, nostalgia and cute animals! And now for something really important–#HoldOnToTheLight 2017 returns with new authors and more fantastic posts! #HoldOnToTheLight is a blog campaign with 130+ of your favorite Sci-Fi and Fantasy authors sharing their personal stories about how depression, PTSD, anxiety, self-harm impacted them and their books. You can find links to all of the posts at HoldOnToTheLight.com. Please—read the stories, share the stories, change a life.